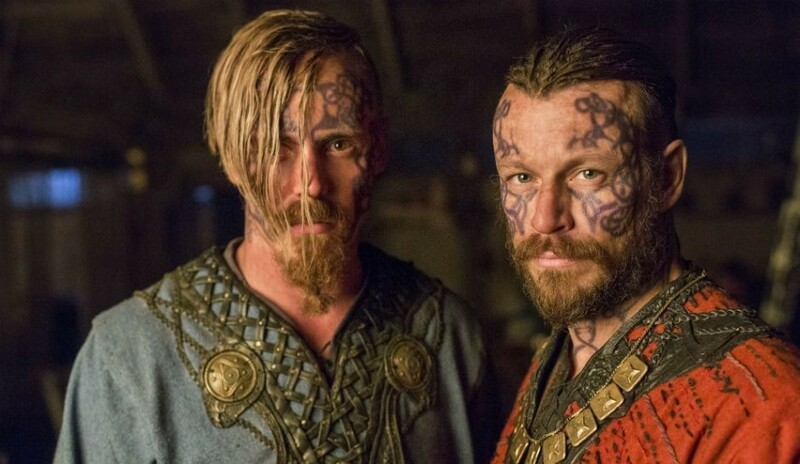 To celebrate the return of Vikings to TV screens, I decided to focus on two characters that might – or not – prove important in the coming episodes: Harald Fairhair and Halfdan The Black, the well-tattooed brothers who… you know spoilers for all previous episodes are coming, right? Click to read further. 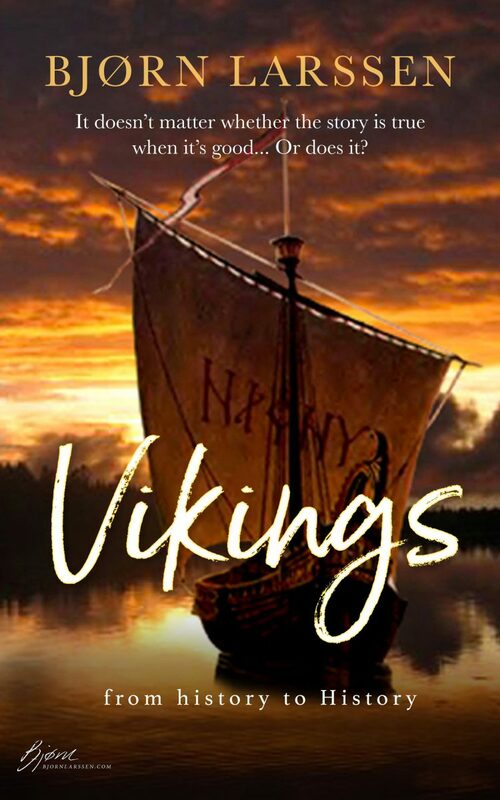 Note: I intend to clean up, expand, and put together the posts from Vikings Deconstructed series as a free e-book which will then be offered exclusively to subscribers to my newsletter. Subscribe using the form on the top left of the page. Snorri Sturluson was kind enough to devote a whole saga to Harald. He imaginatively called it The Saga of Harald Fairhair. It is included in Heimskringla, written around the year 1230. The original manuscript was copied in the 17th century which proved a good idea, as the original parchment copy – referred to as Kringla – got destroyed in a fire in 1728. According to the Saga, Harald became king at the age of 10 when his father Halfdan (Halvdan) died. It is said that he defended the throne with the help of his uncle, which I would imagine might have worked the other way round unless he was an extremely talented ten-year old. As evidenced in Vikings, Harald proposed to a woman called Gyda, daughter of king Eirik of Hordaland – another part of Norway. Gyda was ten years old herself, having been born in 852, whilst her overexcited potential fiance himself was twelve. Nevertheless, Gyda had high standards, and refused to marry Harald until he had a proper kingdom, and not just some pesky bits and bobs that Halfdan left behind. Hearing this. Harald vowed to neither comb nor cut his hair until he united all of Norway under his reign. Seeing as “Fairhair” is actually a rough translation of the word hárfagri, the meaning of which is closer to “fine-haired” or even “beautifully-haired”, one feels a bit doubtful at this point. One might be right, because the existence of Harald Fairhair has not been proven beyond doubt. The oldest text referring to a “king of Norway” is an inscription by the king Harald Gormsson during his reign between the years 958-987. Previously the only reference (Snorri wrote down his findings in the 13th century) to Norway/Norwegians at all was recorded during the reign of King Ælfred of Essex (871-899). No reference to the existence of a king of Norway exists in the text. The first reference to the name “Harald Fairhair” comes from the year 1048, and is later recorded in multiple Anglo-Saxon sources. While Harald as portrayed in Vikings is, indeed, very special it’s hard to believe he’d live to the age of 196 or longer. But this isn’t all! 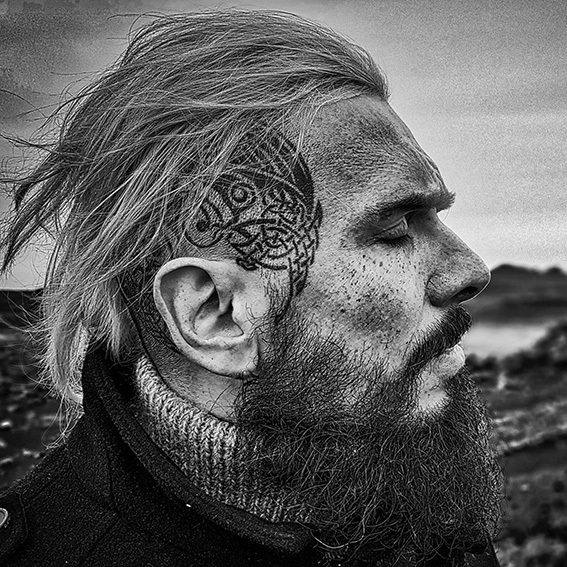 In the saga Glymdrápa, composed by Þorbjörn Hornklofi, the court poet of King Harald I of Norway also known as Harald Fairhair towards the end of the 9th century, battles of the king Harald who was busy unifying Norway are recorded. According to Ari Þorgillson’s Book of the Icelanders, Ingólfur Arnarsson (and others) left Norway due to Harald Fairhair being an assh– typo! Not a very pleasant person. Which leads us to a similar situation as with Ragnar Lothbrok himself, where we have various somewhat random sources talking about the king Harald Fairhair who might or might not have existed. 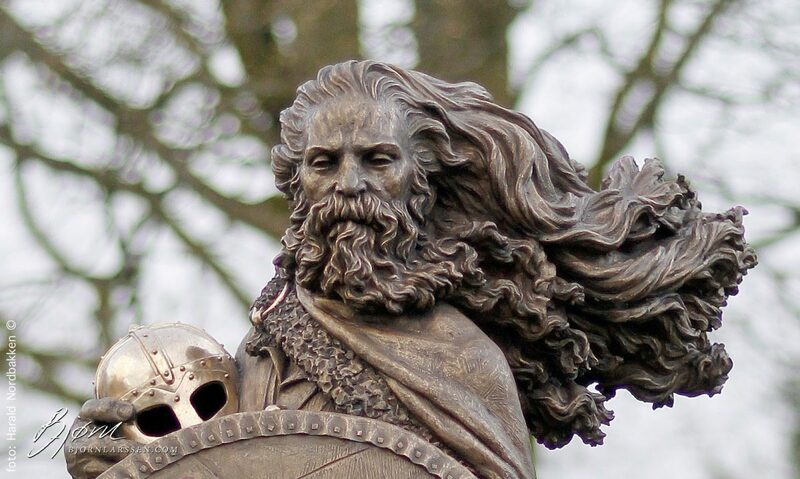 Harald Fairhair Statue in Haugesund, Norway. Photo: Harald Nordbakken. The historical Harald spent quite some time arguing with the grandson of King Ælfred, one young man called Athelstan. Both of them thought themselves to be the more royal one than the other. Athelstan sent Harald a beautiful sword, which Harald took by the hilt, meaning he accidentally made himself a subject of Athelstan. Harald, understandably, wasn’t pleased by this joke. His retribution might strike you as somewhat odd, as Harald sent his son Hakon to Athelstan, asking the English King to become Hakon’s foster-father. Since a foster-father’s position was considered lower rank than that of the biological father, Athelstan at first wanted to kill the boy, yet understanding that this wouldn’t disturb Harald quite enough – as according to the sources the beautifully coiffed Harald fathered between 11 and 20 sons, which you will admit made it possible to miss one or two – he took Hakon as his own. 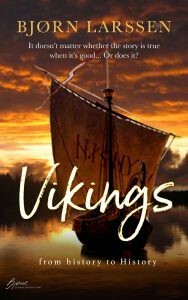 I know the number of Harald’s sons made you worry about poor Gyda, who had to be pregnant practically non-stop, but fear not, for the five sons of possibly non-existent Harald, ones whose existence has been proven, were borne by at least five women. Gyda herself gave up after the fifth and who could blame her? Heimskringla lists a total of 21 children of Harald. Young Hakon was raised by King Athelstan as a Christian, and when he heard about his father’s death in 934 Hakon decided to go to Norway and check how it was doing. Harald died in 933 (unless he didn’t exist), having first distributed his kingdom among his many sons. Michael Hirst has enough material for at least 100 seasons of Vikings. Halfdanr Svarti lived approximately between the years 810 and 860. Since Harald became king somewhere around 862, we can assume that either Vestfold – a county in Norway that Halfdan ruled over – remained without a king for two years, or that historical sources might be a bit off. I’m inclined towards the latter, seeing as Harald might have not even existed. 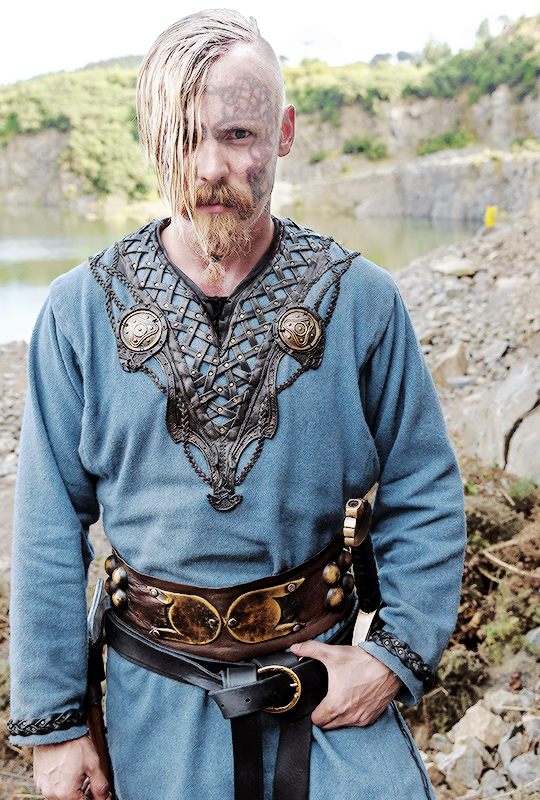 Halfdan’s nickname came from his pitch black hair colour. You will notice that History Channel didn’t pay particular attention to this detail. As to why, it beats me. Halfdan apparently had not just one but two sons called Harald. He must have been rather fond of the name. The first Harald, the son of Ragnhild, fell ill and died soon after his mother. Halfdan, determined to have a son called Harald, tried again with his second wife, also named Ragnhild. This time his plan worked better, as evidenced by the first part of this post. Multiple sources confirm that Halfdan died when his horse and sleigh broke through the ice over the lake Randsfjorden in Norway. According to Heimskringla, each of the districts of his kingdom wanted a piece of Halfdan. This is not a metaphor. As a result of their desires, his body was divided into four parts, each of them buried at a different spot, all of them called Halvdanshaugen (Halfdan’s Mound). Other sources don’t indicate such greed for poor Halfdan’s body parts, instead informing us that he was buried in just one mound at Stein in Ringerike. Personally I’d be inclined towards Heimskringla version, seeing as Halfdan was a bit fan of multiplicity. The trailers for the second part of season 5 of Vikings show Harald and Lagertha not being particularly friendly towards each other. Harald’s potential lifespan was 852-933 (more or less). Depending on the sources, Lagertha might have been worshipped by and eventually married to Harald. The small problem is that Lagertha also appears in sagas of the 6th century, where she is married to a king called…Halfdan.